Focusing on a small serpent-handling church in West Virginia, this film is an in-depth portrait that not only shows two fascinating serpent-handling services, but answers many of the questions that viewers have about the religion and the people who practice it. 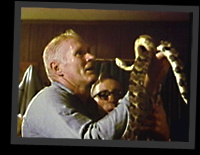 The film is richly layered with varied scenes: the rattlesnake hunt through the mountains; the washing of the serpents; the annual outdoor homecoming; colorful exteriors of the countryside; a rare documentation of an all-night prayer vigil held for the victim of a rattlesnake bite; and many interviews taken with the people inside the relaxed and natural settings of their homes. Church members speak of why they handle serpents, what gap it fills in their lives; what it’s like to grow up in the religion; the persecutions they have suffered; and the pain of losing a family member to the poisonous snakebite. But it is not all pain and suffering, for the people are linked by deep beliefs, strong family ties, and a wonderful sense of joyous gospel music. Several scenes of people singing and playing music together give us another side to the fabric of their lives.